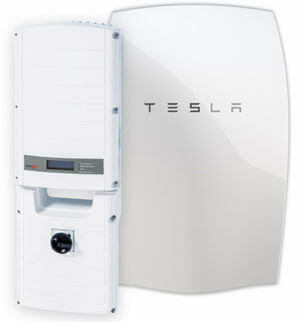 Upgrade your PV solar panels with battery storage. PV solar panels and battery storage allow people to benefit from the sunshine during the nighttime. Incorporated storage capabilities was a game-changer for photovoltaic adoption. Today, PV-to-battery storage systems are smart monitoring, management and storage products that put your solar panels excess power to intelligent use. Using the sunshine at night with a battery storage device felt smugly satisfying for those earliest of adopters. No longer paying to import electricity during the most expensive part of the day is the key to this technology. 75% of a typical household's energy costs are in the evening times. A lithium-ion battery in which one layer called the cathode, is made of a blend of nickel, manganese and cobalt oxide (NMC) and are similar to EV (electric vehicle) batteries. 80% charge capacity after 15 years. "PV with battery storage was the first game-changer; electric vehicles come a close second." Adopting self-generation cuts out the costly middleman to allow homeowners to cut energy costs long-term by generating and storing self-generated power. Energy generated and consumed on site has always been the cleanest form of energy - now it's the cheapest too. The latest self-storage battery technology enables additional financial benefits from PV solar panels and achieves the environmentally desirable state of self-sufficiency in many cases. Installing an energy monitor such as the SolarEdge enables you to track energy generation over a day, a week or a year. Using this information, you can potentially decide when the panels are generating enough power to charge the car. There's nothing more satisfying than powering your own home, but what if you're out all day? Battery storage means that you'll store the power generated and use it in your evening time instead - equally as satisfying too. Additionally, when you return in the evening, the hot water from your taps will have been heated by your solar panels too, making your evening bath that much more satisfying! Battery storage is all about reducing reliance on costly power from the National Grid and finally being able to bring down the cost of living in the 21st-century. Battery storage installations come with minimum fuss. DIY installations aren't possible because a Part P electrical qualification is required legally. A typical house using the national average of 3800 kWh per year and solar PV system generating 3500 kWh per year. Price of electricity per kWh is 0.12 pence. The Energy Saving Trust quotes an average saving of 125.00 per year for a typical home; they also quote 0.145 pence per kWh. 125.00 divided by 0.145 = 862 kWh used in the home from the generated solar PV system or a saving of 23% of the 3,800 kWh. If you use 3,800 kWh per year, you use on average 10.41 kWh per day, so it's only possible to save 10.41 kWh per day. 3 KW solar PV generating on south facing roof 3000 kWh per year. The unit price of electric per kW, 0.13 pence. Ordinary PV savings without Battery storage according to the Energy saving trust (EST) is 125.00. The EST quote 0.145 price per kW so 125 divided by 0.145 is 862 kWh per year. Battery Storage savings over 300 days @ 5KW (size of battery bank) 1500 kWh @ 0.13p =195.00. Export payment if available 3000 kWh @ 4.3 p =129.00. Export payments 3000/2 x 4.86p =72.90. The total savings for year 1 =125.00 +195.00 +129.00 +72.90 = 521.00 GBP. (Figures exclude savings from PV-heating converters at approx 200 GBP per year). Lithium ions interspersed throughout many layers, so when the battery gets charged by the sun, the resulting electron current drives the lithium ions out of the cathode and into another layer, called the anode that's made up of stacks of graphite. How many hours does battery storage give? Several, but depends on how many appliances are used. A 10 kWh sized system will give you ten kilowatts over an hour. A hair dryer takes about 1 kW to run, while a washing machine uses several kW to run, but generally, a battery store can power an average household for several hours in the evening. Typically, 3000-4000 recharging cycles from a full drain to full charge. The system is designed to switch between devices on demand and seamlessly automatically. Can I still use Economy 7? Yes. Ensure you make the installation team are aware that you have Economy 7, so they can structure the install to draw from the grid rather than the battery after 11 pm. All PV solar installations come with a manufacturer and installation warranty of ten years.